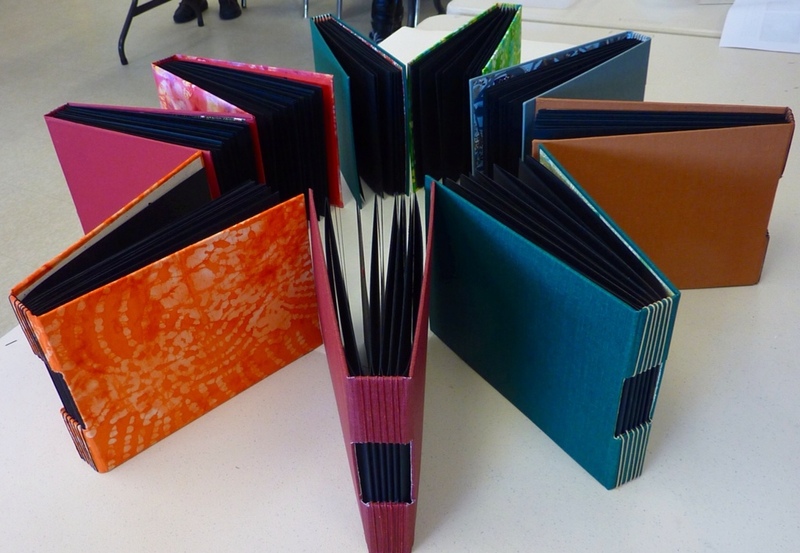 The Canadian Bookbinders and Book Artists Guild (CBBAG) Ottawa Valley Chapter, held another workshop recently. 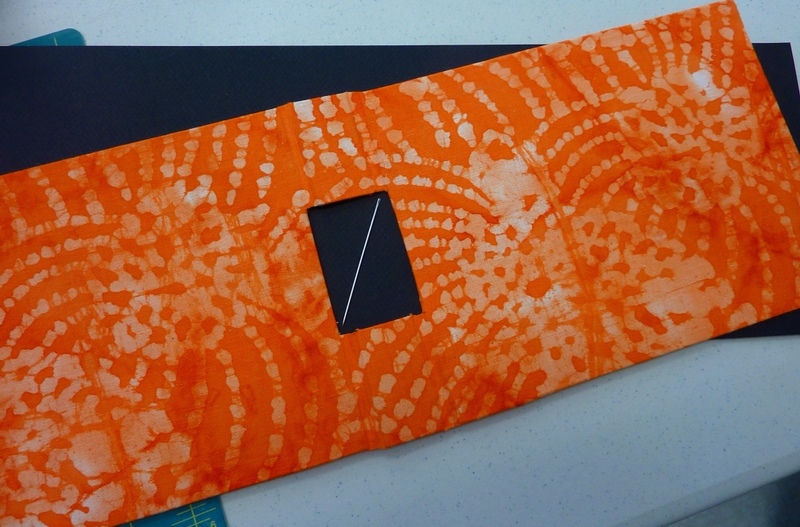 Our instructor, Mary McIntyre, led us in making a simple and elegant photograph album. Mary is a paper conservator and master bookbinder. She enriched the workshop experience for us with her interesting presentation on the history of albums. 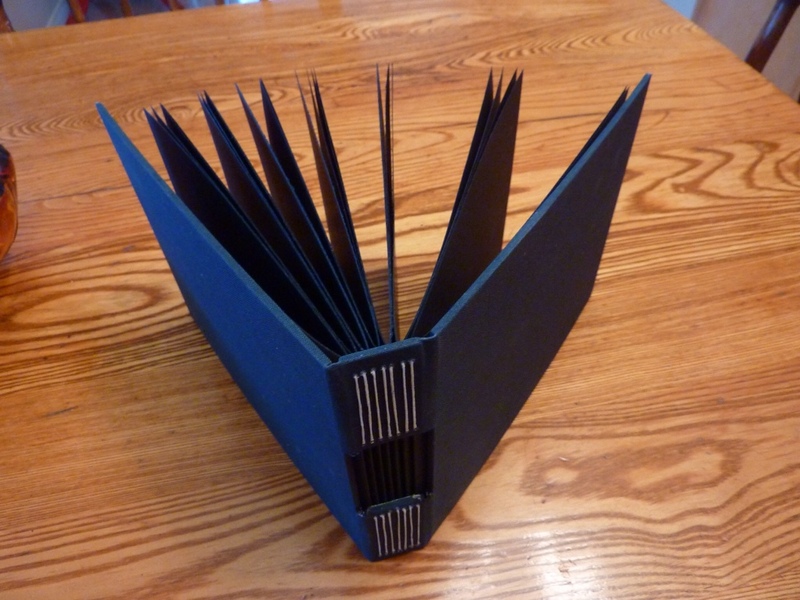 Most enriching was her generous sharing of expert knowledge of bookbinding way beyond the topic of album-making. Workshop participants, each in their area of interest and expertise, also shared generously. It was a very satisfying experience. How pleasant to be a member of such a generous group and to learn and share so freely. 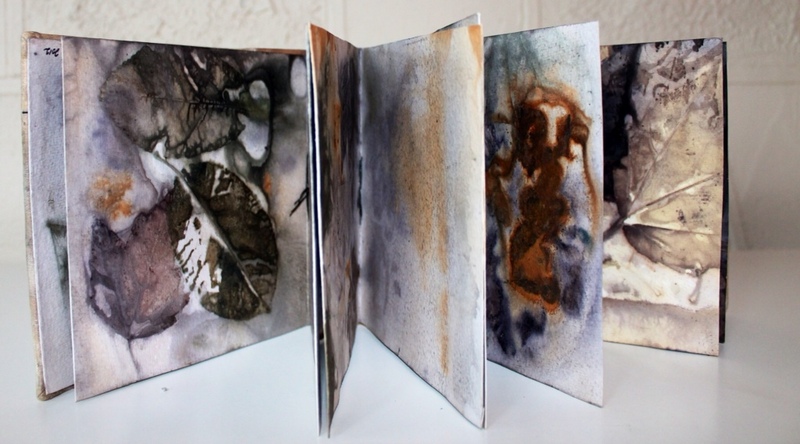 One of the principal aims of CBBAG is to pass on the knowledge, skills and attitudes required for bookbinding and the book arts, and to actually plan for a time when students might become instructors also. CBBAG is not a guild where trade secrets are the order of business! No NDA's required. In the past, though, in other guilds, strict secrecy and Non Disclosure Agreements (NDAs) represented important values to the master artisan. Diane Vogel Maurer reports in the introduction to her book ” Marbling: A Complete Guide to Creating Beautiful Patterened Papers and Fabrics” that “much of the work was accomplished secretly behind wooden partitions and masters were careful to teach only a few aspects of their craft to each worker to prevent any of their apprentices from learning enough to establish himself as a competitor.” (p15) That proprietory approach to teaching and learning marbling had its lifespan cut short by Charles Woolnaugh who “divulged the whole process“ by publishing a book, despite the outrage of the guild. James Sumner, Woolnaugh's chief rival, did not take such severe umbrage, however. Recognizing the value of disclosure to the progress of knowledge and of healthy competition, Sumner pragmatically published his own book on marbling. I have to say I like the cut of both their jibs. 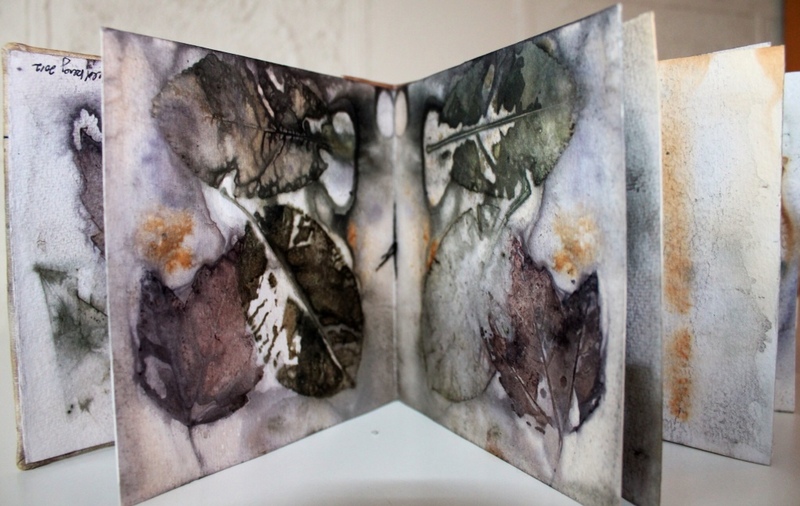 So here I am, Spilling The Beans again on my blog, today starting with some images of the albums we made at the CBBAG workshop. Mary supplied us with bookcloth she had made herself from Quilter's Quarters. Mary divulged her secrets, too, in the self-respecting context of a workshop. To make the bookcloth, she revealed that she applied a simple cornstarch paste to the back of the cotton and let it dry. (Wheat starch paste works too. A recipe for corn starch paste is at the end of this post). 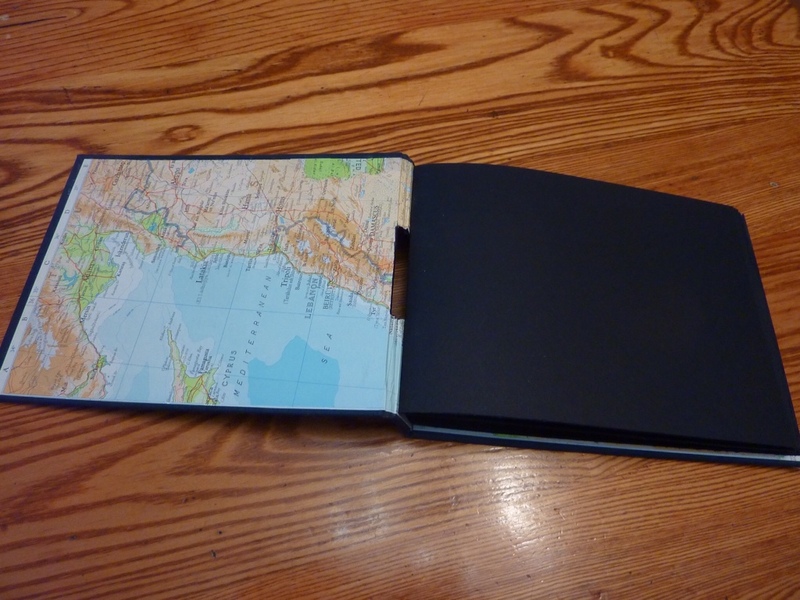 The bookcloth covered the outside of the album and we had some pretty Japanese papers to line the inside covers. To construct the album pages, we cut Fabriano black pastel paper to size, sewed the stacks of signatures together (I made my first Kettle Stitches!) 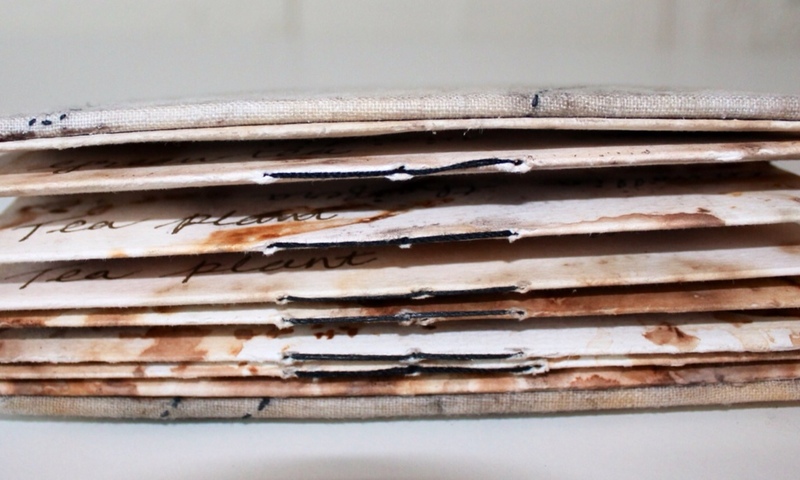 and made some decorative stitches over the spine of the album. My album is the orange one. You can see the elegant effect of the spine-wrapping threads on all these albums. We cut rectangular apertures in the spine board to enjoy a view of the sewn signatures. I love that feature! The linen thread we used to sew the signatures was brought through the aperture, then around and over the spine at top and bottom. 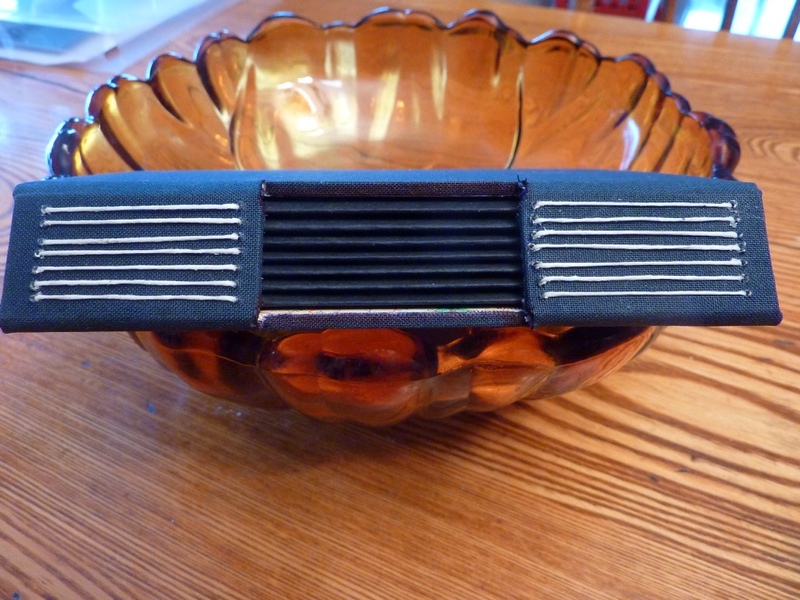 This gave a lovely thread texture to the outside of the spine. Husband made the green one. He made another album at home. His engineer's mind caused him to figure out how to make the spine decoration threads more stable ( they do kind of shift around) so he simply pierced holes in the spine and brought the thread through them. Four parts water to one part corn starch. Cook over medium heat until thick and smooth, stirring all the time. 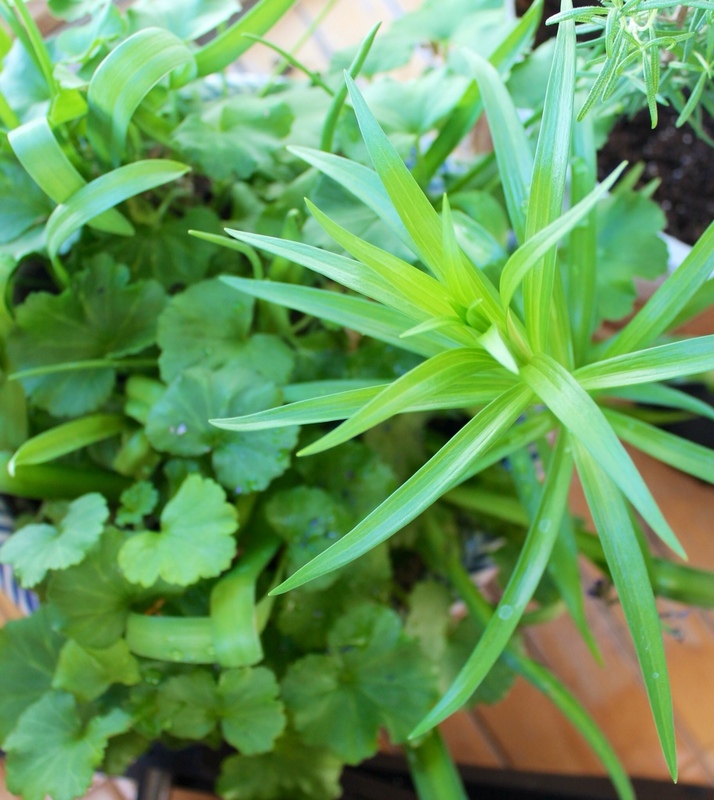 Thin with cold water and beat to remove lumps, to make a paintable mix. Thinner is better. 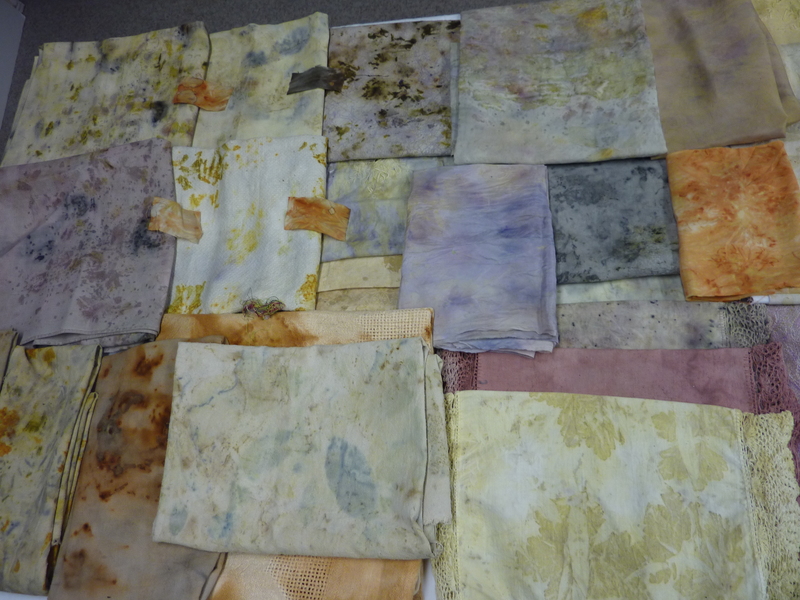 In the CBBAG workshop, our instructor, Mary McIntyre, shared aspects of her practices re attaching papers to textiles. I have been reading “Magical Secrets About Chine Colle” by Brian Shure of Crown Point Press. Brian is another artist maker like Mary, dedicated to a legacy of teaching knowledge, skills and attitudes in a self -and-other -respecting but generous and open manner. One way Brian does this is through his books. 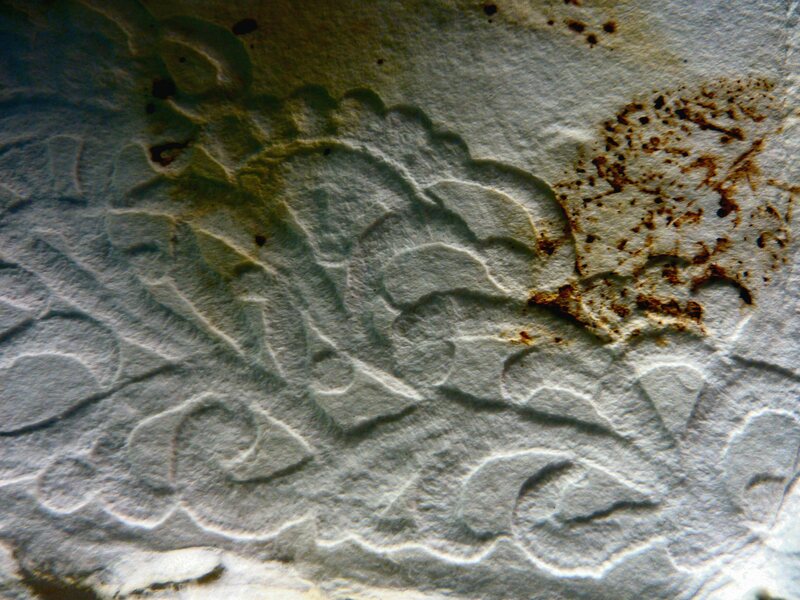 His information on using paste with paper and textiles is very valuable. He shares expertise fully in his book with the goal that you and I as readers will learn and pay it forward. In future posts, I plan to report more of how I am using Mary's and Brian's processes of attaching papers to fabrics. PS The bookbinding needle inside the spine aperture gives a sense of scale. In just a few days, the darkest days will be over and light will stay with us longer! This post, I had been hoping to share some pics of illuminated MSS on loan from the Bodleian to the Jewish Museum in NY…unfortunately, I seem to have lost them somewhere in cyberspace. ( I learned from “The Art of the Saint John's Bible” by Susan Sink that the term “illuminated” refers to the gold used for illustrations in the manuscripts. ) 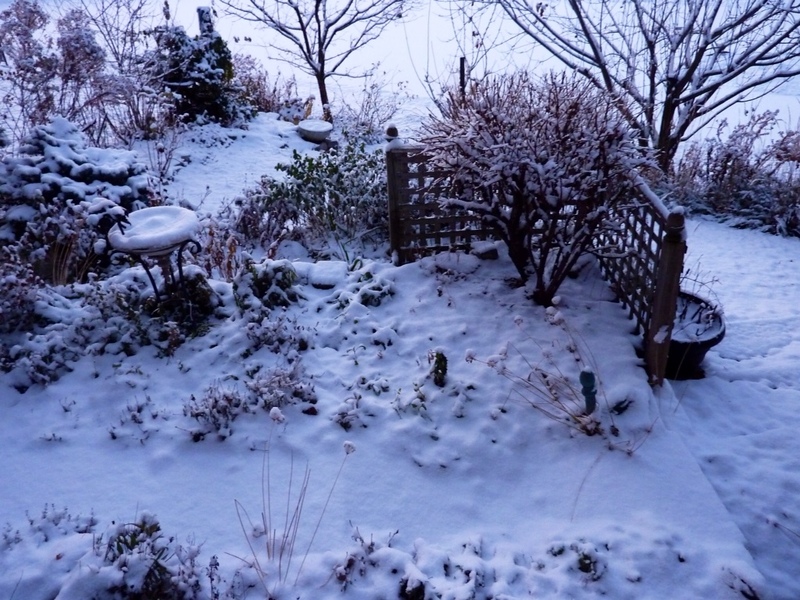 So instead, I offer some images of my dye garden in midsummer and midwinter as illumination to your imagination! The harvest of that garden keeps me close to summer all year. 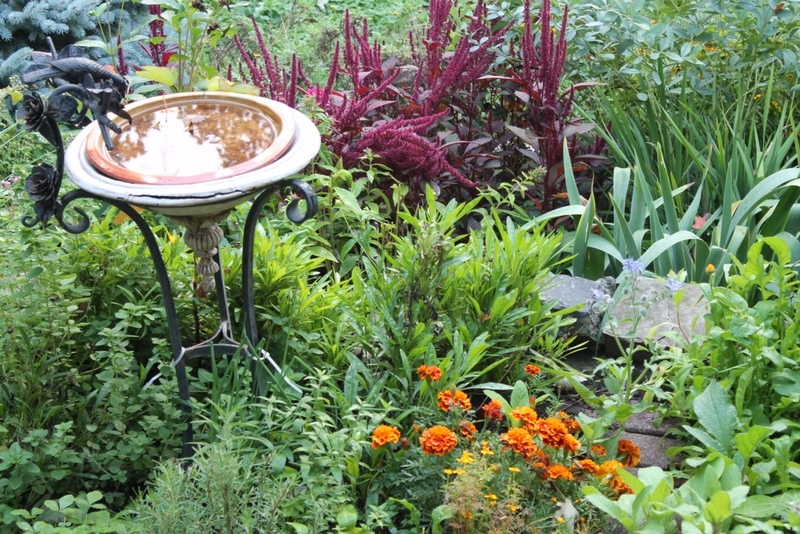 Besides the dye flowers you see in the summer garden ( coreopsis, tagetes, amaranthus, baptisia australis, borage, basil, viola ticolor) nearby are Red Maple (acer rubrum), Sugar Maple (acer saccharum), Silver Maple (acer saccharinum) Chokecherry (prunus virginiana) and from the kitchen, tea (camellia sinensis). 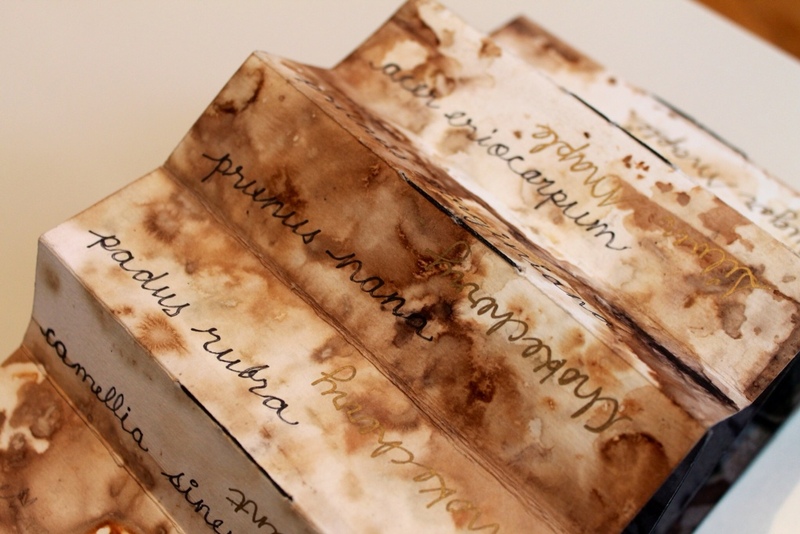 Rust and leaf eco prints provide form and content of the New World Scroll. 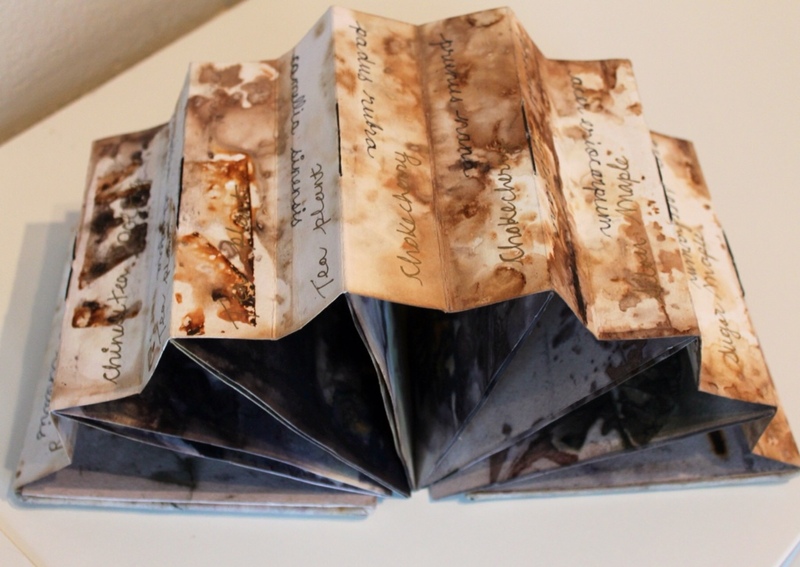 as does the book's accordion structure. The first books were in scroll form, flat or pleated or slatted (depending on its culture of origin). 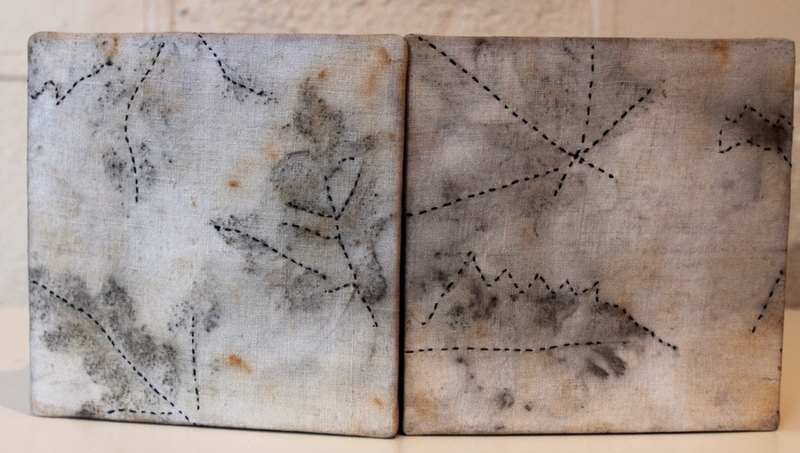 I am using paper to recall ancient form and marking it with plant dyes as a contemporary take on ancient practice, and also as a comment on disappearing traditional natural dyeing knowledge and skills, a loss now connected with disappearing plant diversity and ecological imbalance. I have handwritten the names of the plants in Latin and English as is proper to a botanical document but in pleated scroll style. I have to say I was hesitating to use my own hand ….dreamed of perfect type from an elegant letterpress…but concept and earthiness won out. Hands on, the powerful presence of a maker in the lettering. The plants recorded on the scroll are both native and immigrant, a witness to the ideal of a global sharing of knowledge and skill for the benefit of all. A blog, kind of. 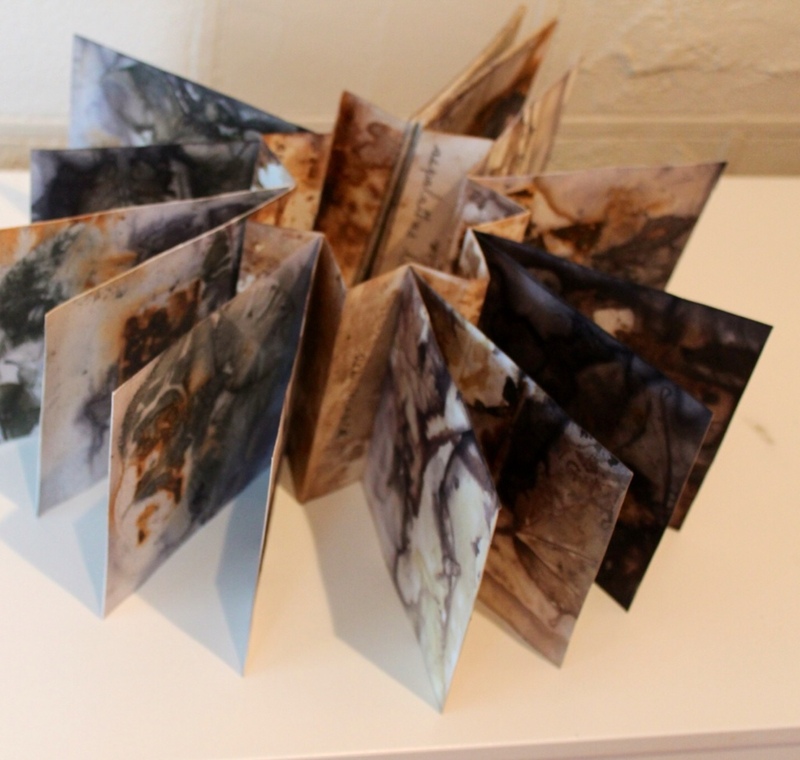 Each double spread is inserted inside a fold in the accordion spine and presents four different prints. There are twenty-four eco- printed pages, two eco-printed end papers and a set of eco- printed and embroidered linen covers. The embroidered and printed covers refer to traditional skills and knowledge that have faded away but which are being recovered gradually in textile circles – women's work, mainly…and with new appreciation for the artistry in the ancient practices. 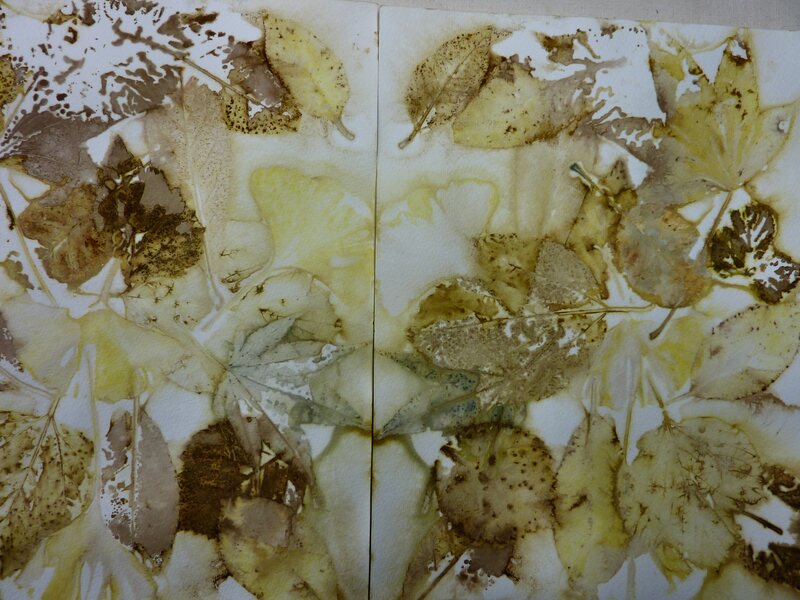 Eco Prints on Paper: Leaves out of the Freezer! 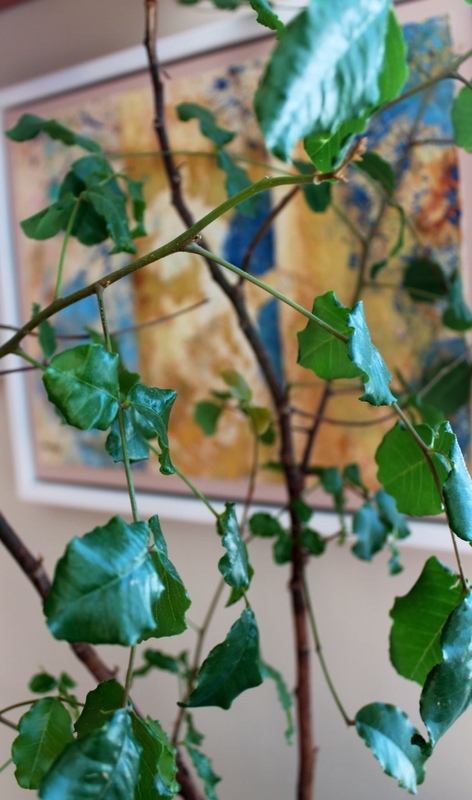 Can one print successfully with dried or frozen leaves? 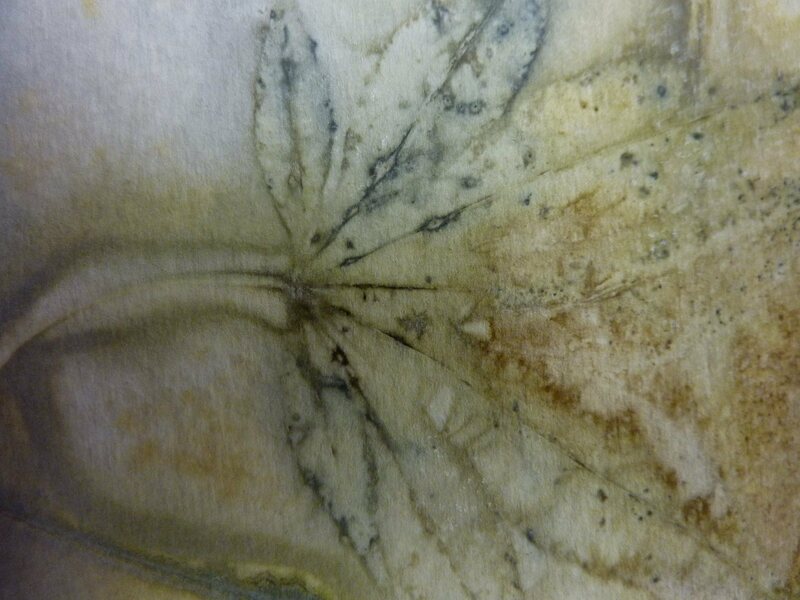 Dye tradition says that certain dried plant materials will colour fabric, and India Flint documents successful colour extraction from frozen flowers. 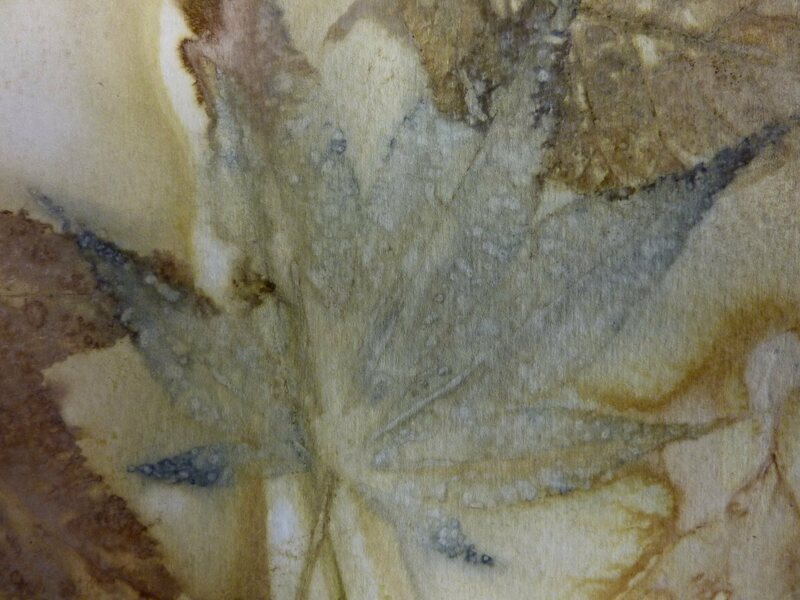 For winter natural dyeing here in Canadian Zone 4 (Ottawa) , I have been drying plant materials and putting others in the freezer, particularly those that have worked nicely for my recent eco prints. 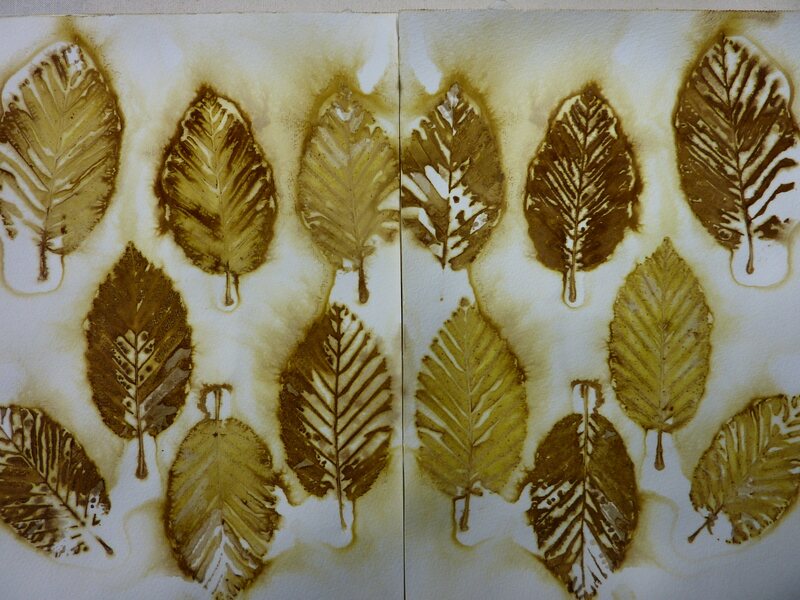 This time I tried printing some of the frozen leaves on paper. I used two kinds of paper, watercolour 140 lb (Canson) and my own handmade embossed papers. 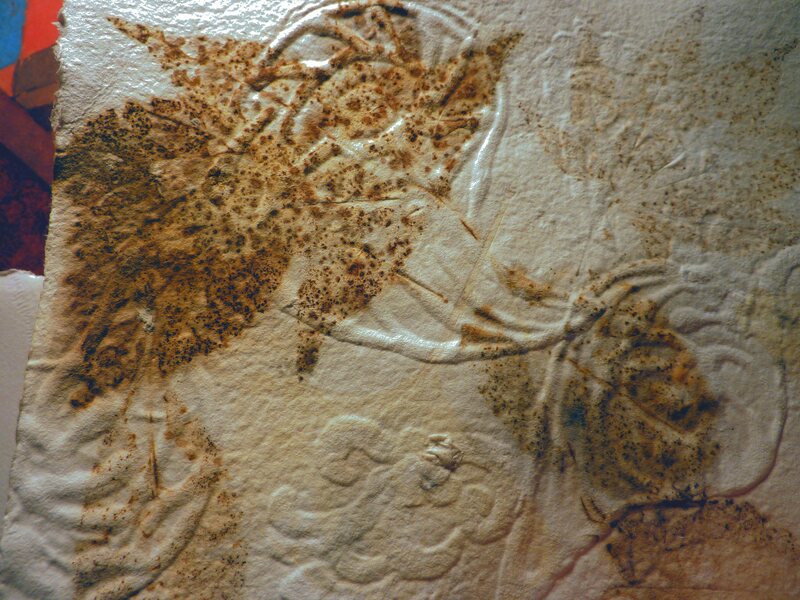 Collection of leaves, eco-printed on handmade, embossed papers. 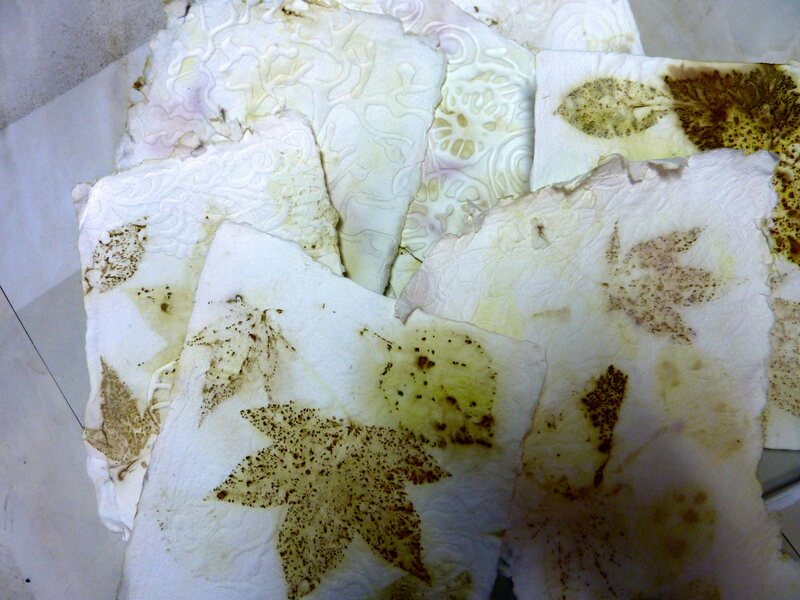 Yes, strange smudges of purple emerged..
Sweet Gum on hot-glue- and lace-embossed handmade papers, from the other side. 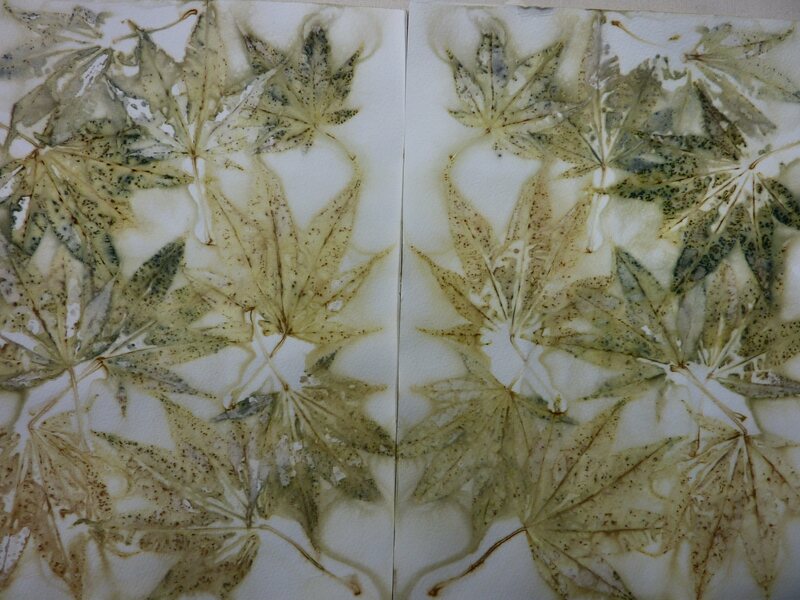 Eco printed Japanese Maple, previously frozen. 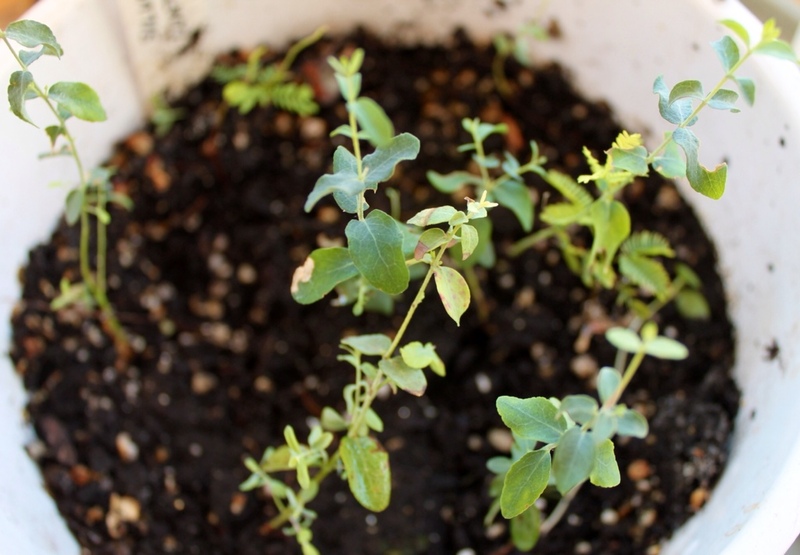 Eco printed Cotinus Coggygria (Smokebush), previously frozen. Eco printed Chokecherry, previously frozen. 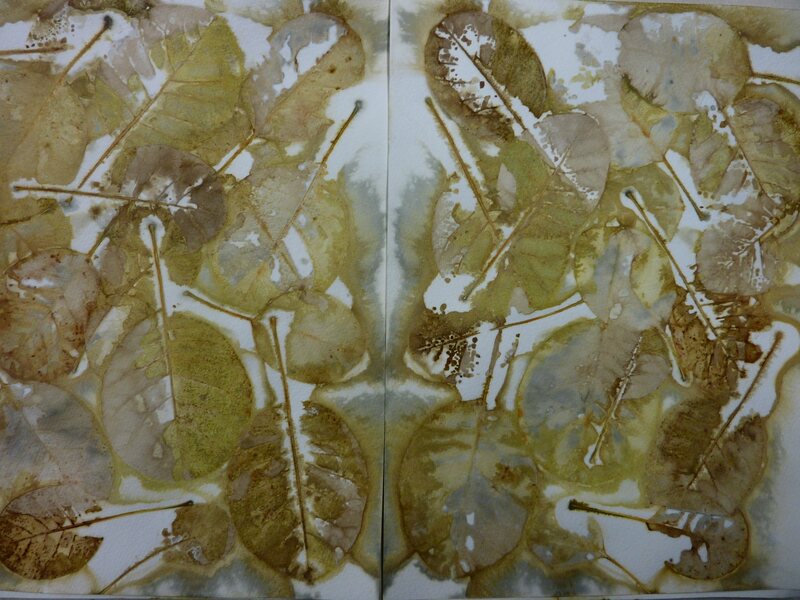 Eco printed alder leaves, previously frozen. 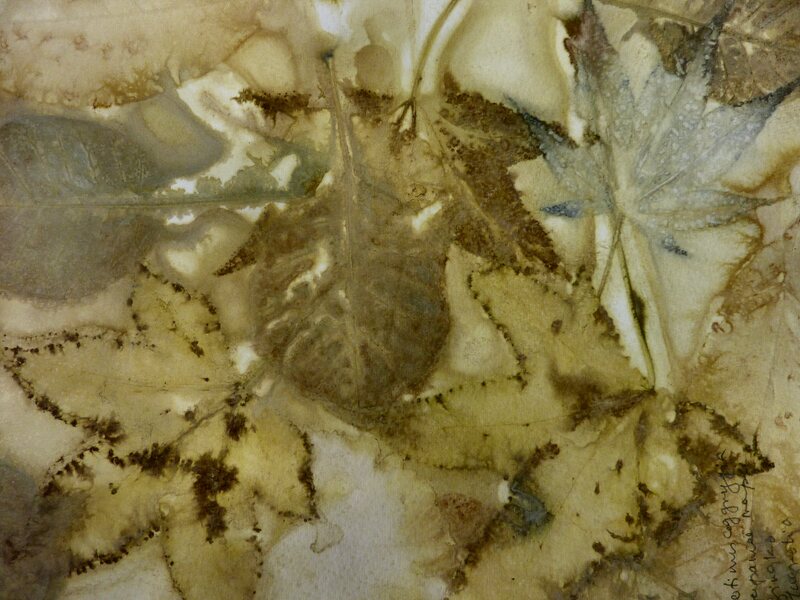 Collection of eco printed leaves, previously frozen. 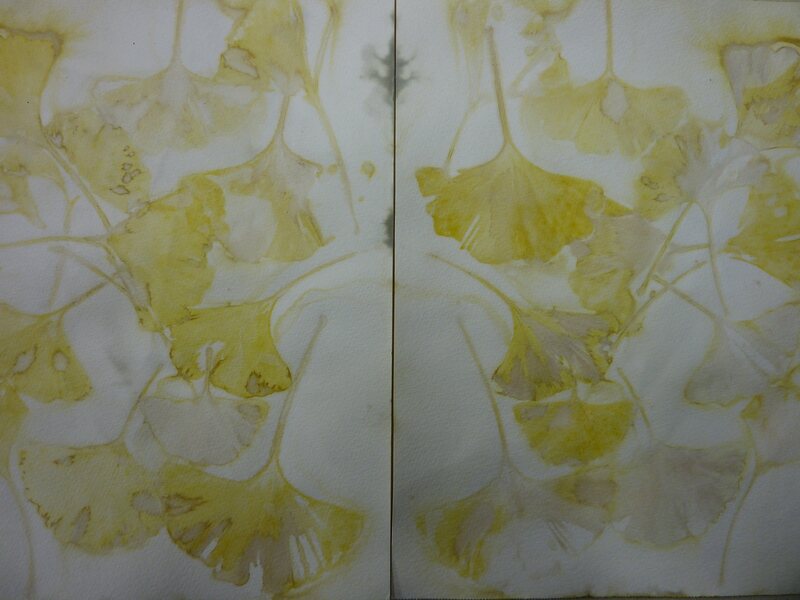 Eco printed Ginkgo leaves, previously frozen. 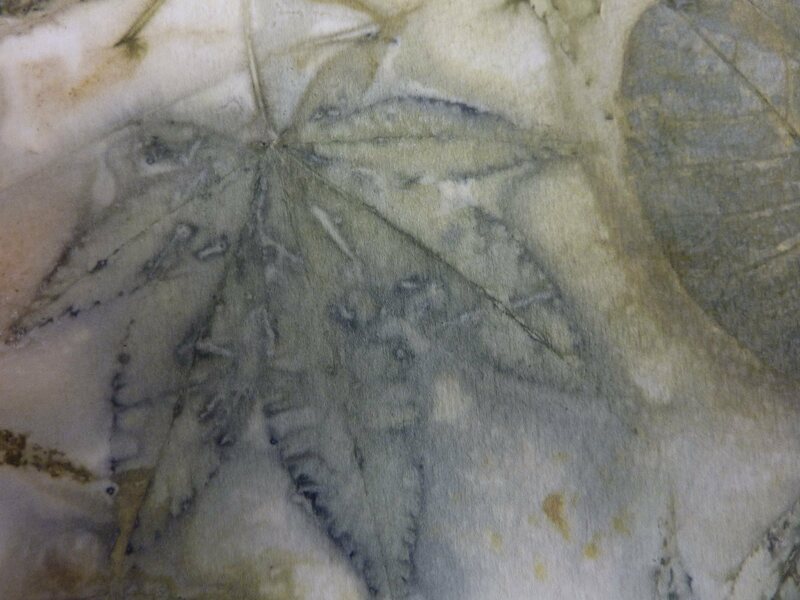 Japanese Maple eco print- blue! 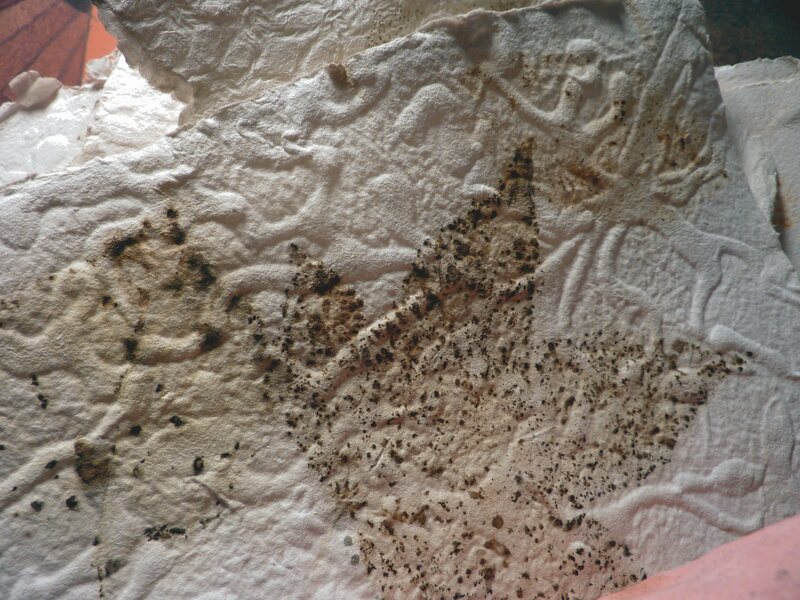 Note on alum: I understand that alum is used in the making of watercolour paper. Would explain why the colours seem to take so much better on watercolour paper than on my handmade stuff? I did not soak the papers very long, maybe 20 mins while assembling the project. 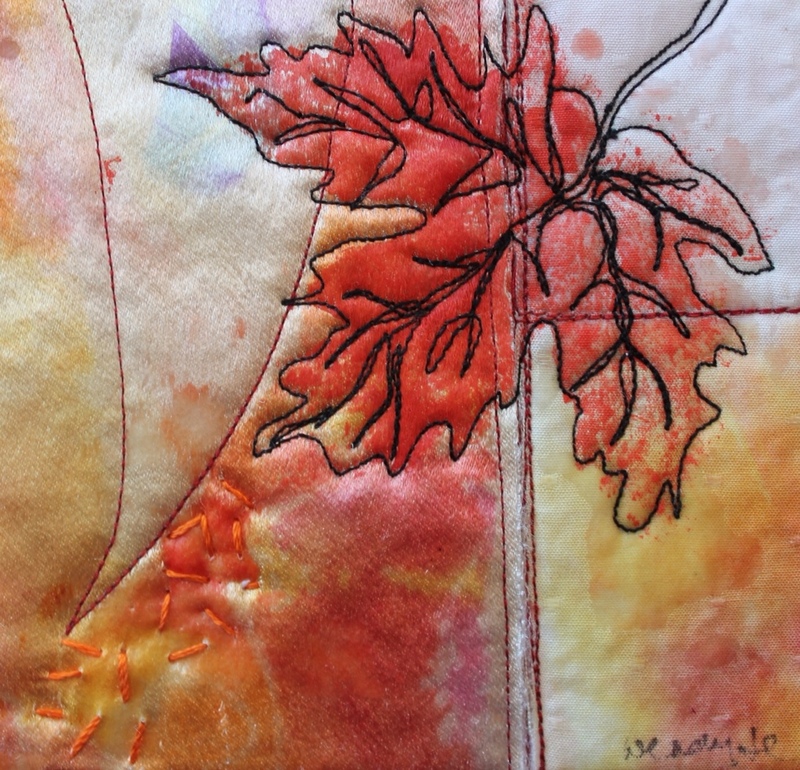 Next post: Frozen leaves eco printed on silk -wool panels. 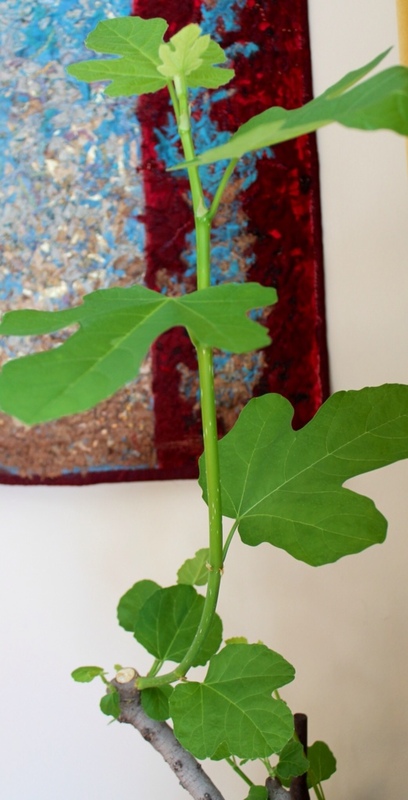 What worked on cotton rag paper …. 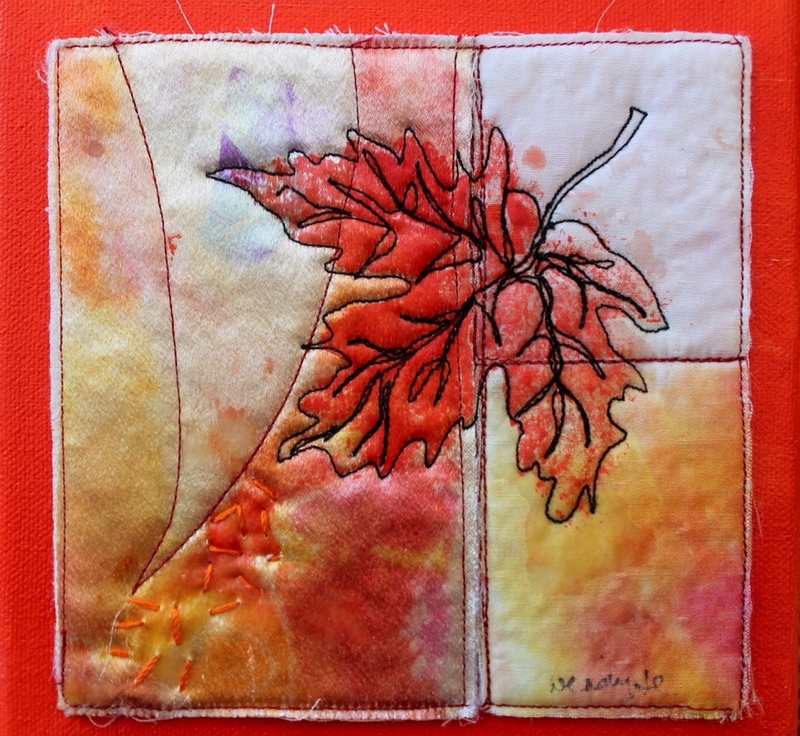 Posted on December 5, 2011 December 5, 2011 Categories UncategorizedTags Eco Prints, Eco prints on paper, leaf prints4 Comments on Eco Prints on Paper: Leaves out of the Freezer! The silk is new, not vintage. 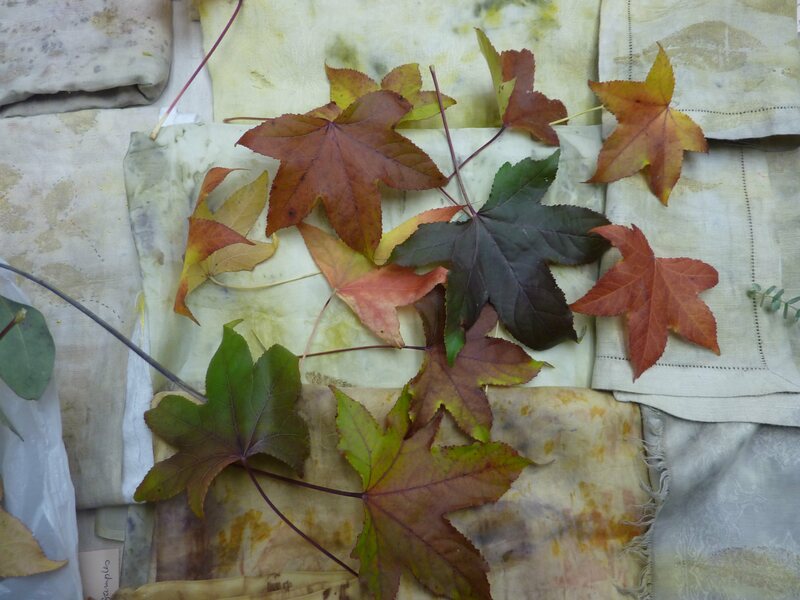 Next I will try eco printing Sweet Gum on vintage linens from my stash, some previously (this past summer) eco dyed one colour all over with carrot tops, marigold, hibiscus, apple bark and others; then perhaps with different mordants, pre-and post eco printing, to force other colour changes. 1. Purple basil (blue), tagetes marigolds (yellows) and Black Eyed Susans (greens); 2. Sumac berries (pinks) 3. Eucalyptus (pinks) , tagetes marigolds (yellows) and darker blues(purple sandcherry leaves). Burned, by accident in the microwave at 3 a.m on a sleepless night. A serendipitous row of marks. 4. Red Cabbage (blue-violets) and marigold (oranges and greens) 5. Red cabbage (violet), purple sandcherry (blue) and light marigold yellow.6. 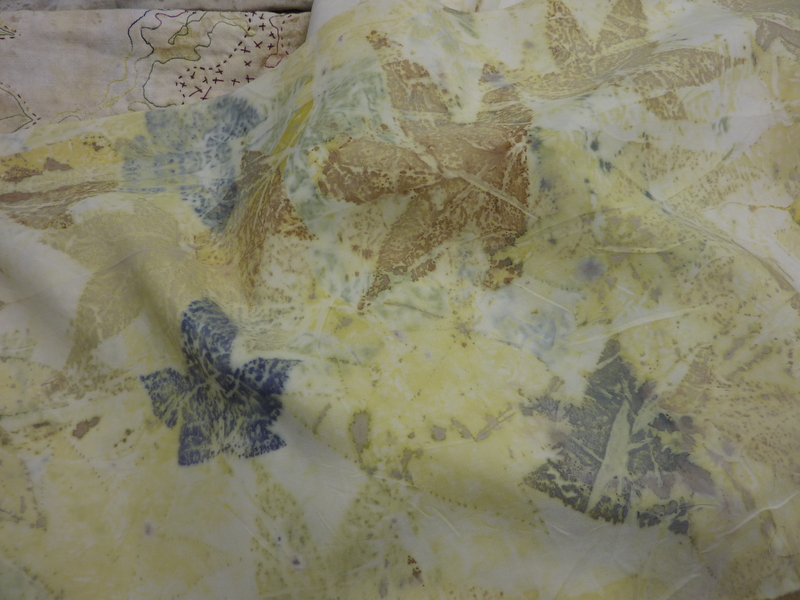 Marigold, dyed,then ecoprinted for varied yellows/oranges. 7. 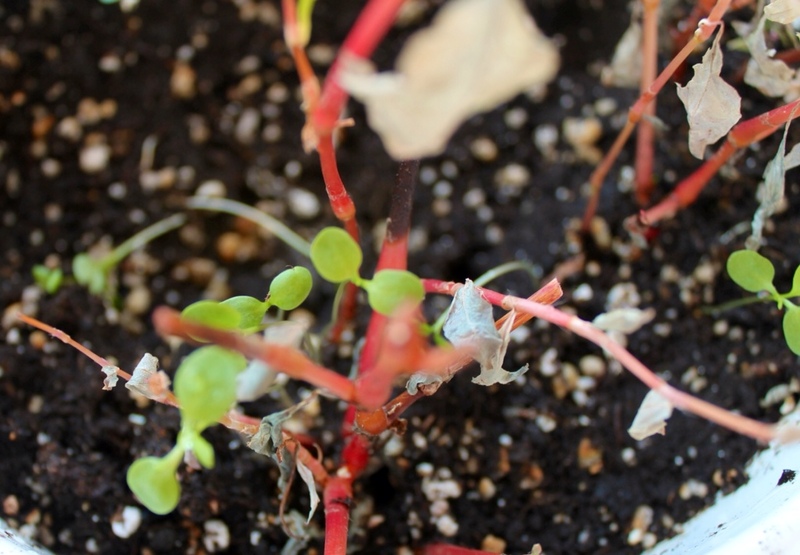 Red Cabbage (violets – and check that fuschia!) 8. 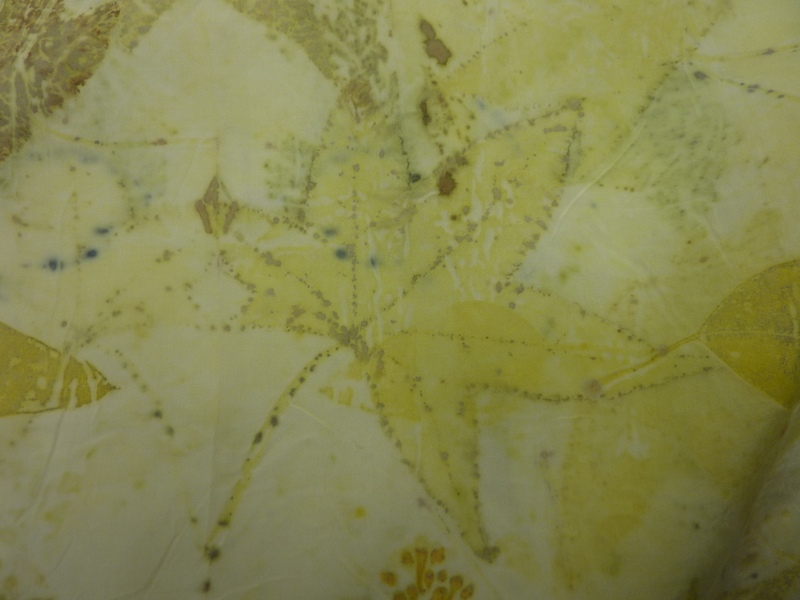 Golden Rod (yellows; greens from the eco printed leaf) 9. 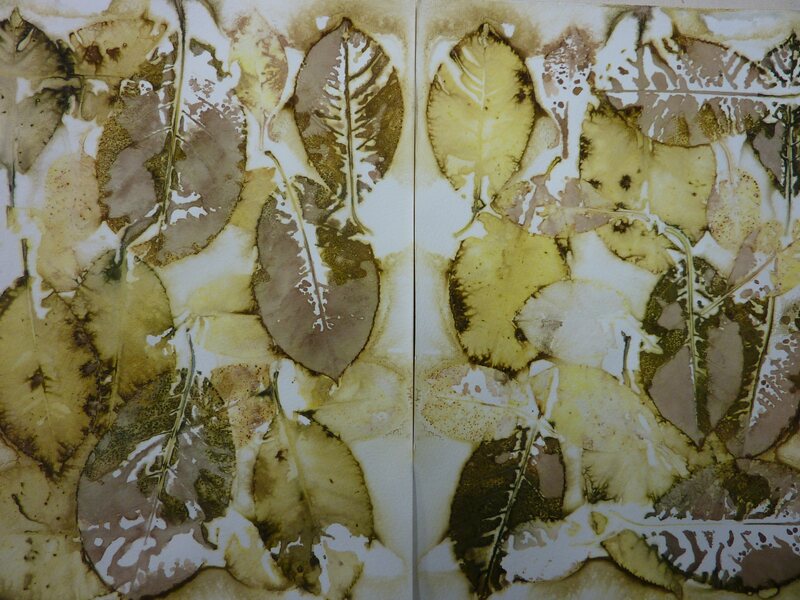 Pear leaf (greenish-khaki brown) and bay leaf (I have a small bay tree in the kitchen – light green) eco print. 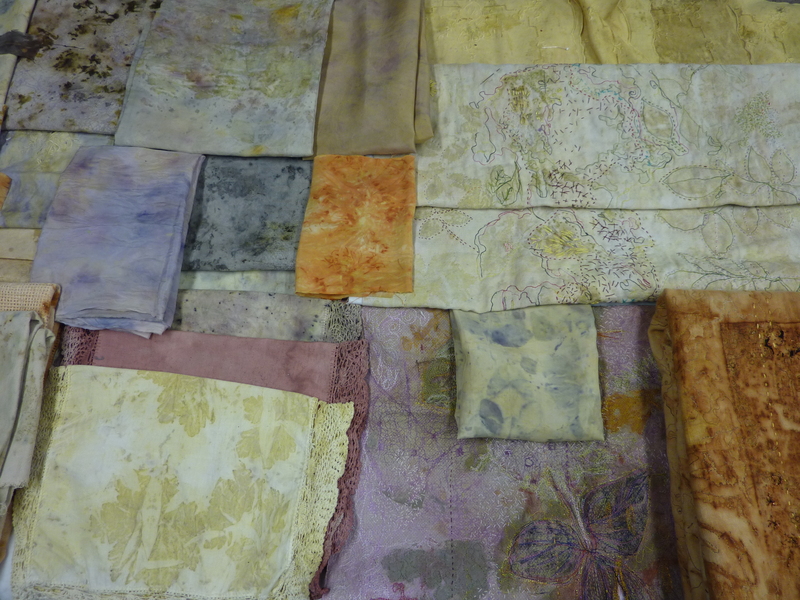 Collection 2:From the top: First is silk noil, ecoprinted with purple sandcherry and geranium leaves, modified with iron to give greys, browns, etc. Second textile is from the same large panel of silk noil ecoprinted as above without the iron modifier. 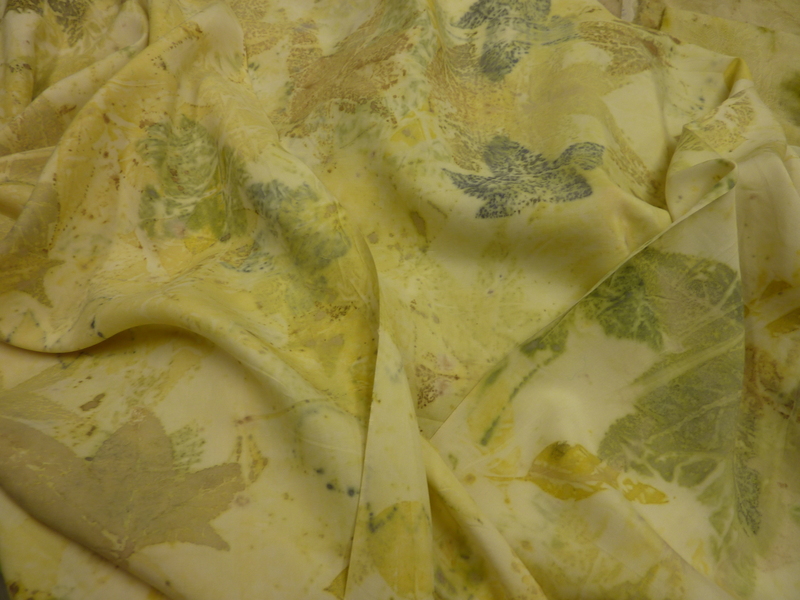 Third is wonderful dark olive-green -grey on silk habotai (8mm); chartreuse green from carrot tops modified with iron. Fourth is tan-brown silk obtained from all-over-dyeing with lichen to give rich dark yellow, then modified with iron and baking soda to give tan; then eco bundled with dried safflower petals which I hope would dye red. The safflower petals had a curious effect: they did not give red (or even yellow). Instead they bleached out the tan-brown dye and left hundreds of tiny peach-yellow-pink-green mottled marks like rice scattered all over the tan silk. (Detail shot later.) Fifth are silk scraps dyed red with deadheaded coreopsis verticillata blossoms. 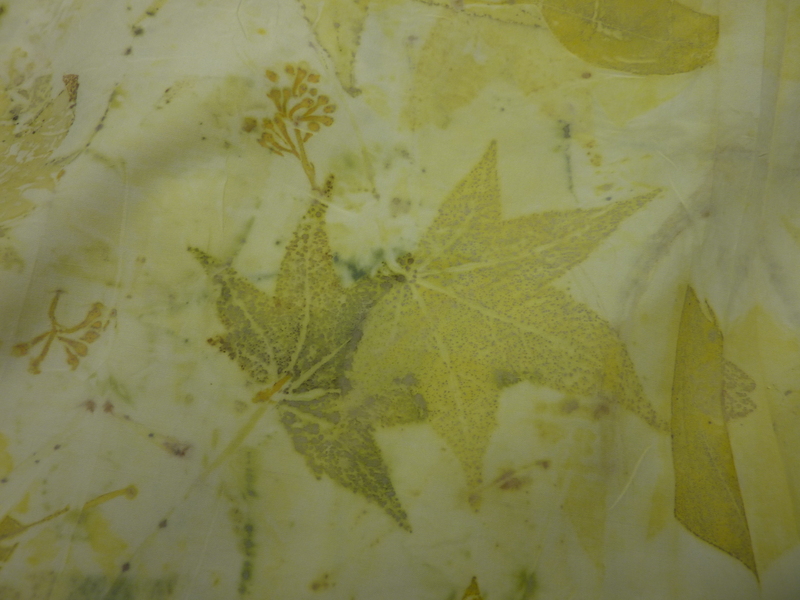 The last silk panel was dyed overall first with lichen (nameless, sorry – I cannot identify it) to give yellow, then eco bundled with eucalyptus leaves for a leaf print (brownish-yellow) ; then modified with iron and baking soda to produce an enticing range of browns and greys. 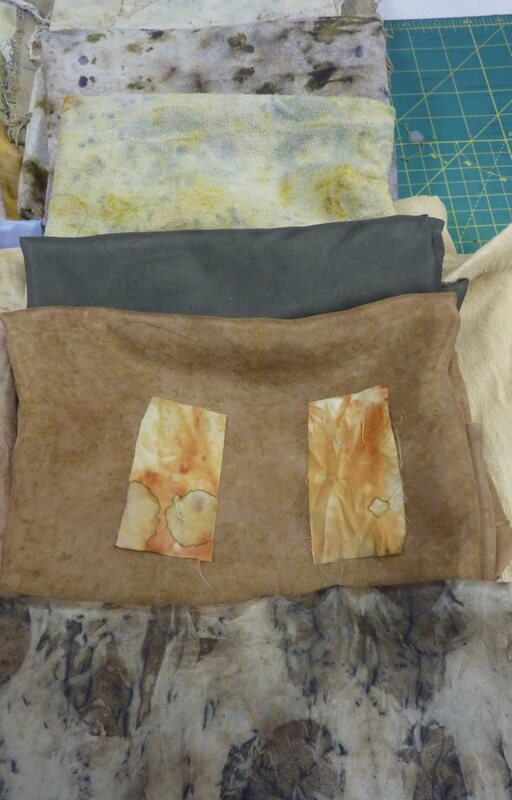 (The orange textile on the far left is a rusted linen- no plants!) . 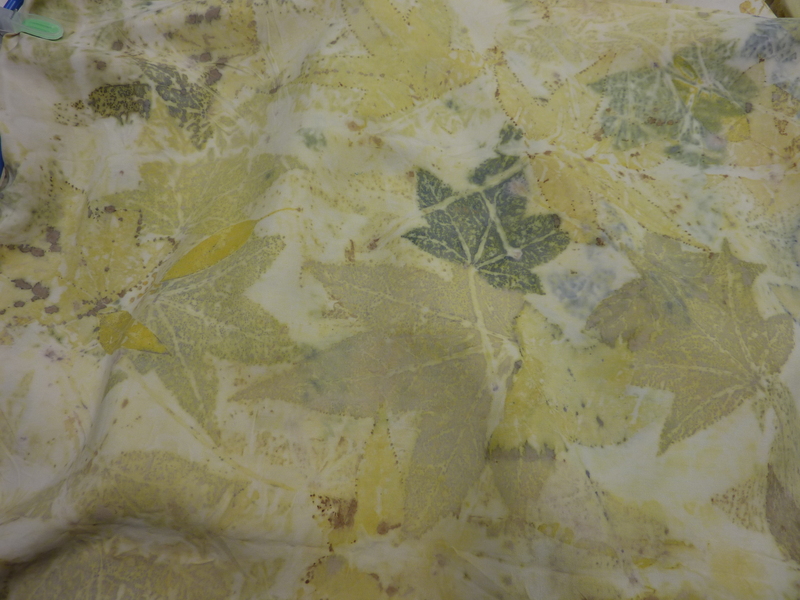 To summarize the plant sources of natural prints and colours: Background dyes are deep yellows and pinkish yellow from apple and cherry barks; yellow-greens from sumac leaves. Other print greens come from geranium and purple sandcherry leaves; ink-blues and purples from purple sandcherry, purple basil and purple bellflower; deep red-orange, oranges and deep yellows from coreopsis, tagetes and calendula; deep pinks, mauves and lighter pinks from dried hibiscus flowers, rosebuds, rose petals and magenta perennial geranium flowers. 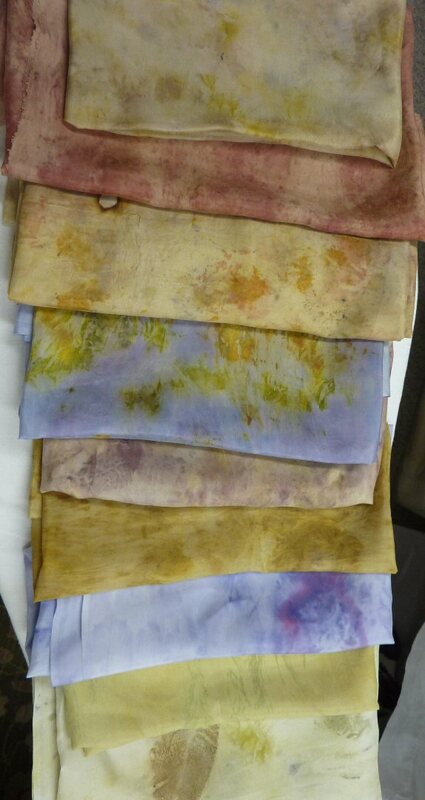 Greys arrive when iron liquor is added to the dye bath: hibiscus and apple in these images. That was June and July in my garden and the dye pot. Next month will bring an abundance of tagetes and coreopsis blossoms; the sumac red candles are blooming already; the hydrangea mop heads are enormous now; the purple basil will plump out more than a few leaves for printing. More experiments!